Modern versions of the diet that humans are thought to have eaten during the Palaeolithic era* (called the Paleo diet or new Paleo diet) are claimed by some to be healthy and to improve sports performance. But what’s the evidence for or against this assumption? There’s not a huge body of studies relating to Paleo diets, but there’s enough to get a flavour of what evidence, rather than opinion, suggests may be the answer to this question. In the following video5 “Paleo Diets May Negate Benefits of Exercise” by Dr Michael Greger, the issue of insulin and Paleo diets is discussed. This is because one of the major arguments used when justifying Paleo diets is in connection with their perceived benefits, when compared with high-carb diets, for reducing insulin production. However, as you will see, the facts don’t necessarily back this up. As far back as a 1966 study6 , researchers have known that meat consumption increases insulin. Beef and fish were highest insulin-production simulators. Subsequent data showed all meats (pork, chicken etc) create the same insulin spike. Meat protein causes as much insulin release as pure sugar. Since research8 indicates that vegetarians’ diets (let alone vegan or WFPB diets) have significantly lower insulin levels than meat eaters’ diets, a Paleo-advocate worried about insulin levels would have to recommend sticking to the plant foods! The same applies to ovo-lactovegetarians9 , lactovegetarians and vegans 10 , when compared with meat eaters. With meat eaters being shown to have up to 50% higher insulin levels. A 2010 study11 found that insulin levels could be reduced significantly in just three weeks of eating a healthy vegan diet. A 1996 study12 found that just by adding egg whites back into a vegan diet, insulin production increases by around 60% within four days. On the other hand, a 1990 study13 showed that increasing the amounts of fibre-based carbohydrates can reduce insulin levels. But the above-mentioned CrossFit research2 gives cause for concern for those considering the Paleo option. It’s to be expected that any extreme exercise regime will reduce cholesterol levels for a short period of time, no matter what you eat, if you lose weight. But the Paleo diet resulted in the CrossFit participants increasing LDL levels and decreasing HDL levels – not what you want. The Paleo diet’s negative impact on blood fats counteracted improvements commonly seen with improved fitness and body composition. A 1992 study14 showed the opposite effect when subjects were put on a very modest exercise regime and plant-based diet. In three weeks, LDL levels dropped 20% and insulin levels dropped 30%. This was on a diet of between 70 and 80% carbohydrates. An additional Dr Greger article15 covers much of this information, with additional links. It might be reasonable to assume our nutritional requirements were established in the past, but why the Palaeolithic period? Why only the last two million years of human evolution? We have been evolving for about 20 million years since we split off from our last common great ape ancestor, during which time our nutrient requirements and digestive physiology were relatively set and likely little affected by our hunter-gatherer days at the tail end. So what were we eating for the first 90 percent of our time on Earth? What the rest of the Great Apes were eating: more than 95 percent plants. During modern times, in places like rural China and rural Africa, populations were reportedly eating huge amounts of whole plant foods, up to 100 grams of fibre every day, which is what researchers have estimated our Palaeolithic ancestors were getting based on dietary analyses of modern-day primitive hunter-gatherer tribes and by analysing coprolites, human fossilised faeces. Today, with the modern diet, we tend to get fewer than 20 grams of daily fibre. The meat that Paleo advocates suggest is eaten today bears little resemblance to the flesh of prehistoric wild animals. A review in Meat Science17 , for example, catalogued the laundry list of contaminants, including arsenic, mercury, lead, cadmium, and veterinary drugs such as antibiotic residues. Some studies published in the last two decades have shown health benefits of Paleo-type diets (see later). However, questions have been raised regarding their methodology. For example, some were conducted without a control group, for an extremely short duration, with very few participants, or on pigs instead of humans. The basic premise of the Paleo diet is simple—the diet humans ate in pre-agricultural, Palaeolithic times is best suited for human health. Whether or not what these relatively short-lived humans ate is what’s optimal for the health of today’s relatively long-lived humans is a matter of considerable debate. Pre-agricultural diets—which essentially consisted of wild plants, wild animals, and wild fish—varied considerably, depending on location, season, hunting and gathering skills, available tools, etc. People didn’t consume oil, sugar, or salt; anything from a box or bag, or the milk of other mammals. Followers of the new Paleo diet naturally assume that their nutrient intakes approximate that of Palaeolithic humans, but their actual intakes may be wide of the mark. Nutritional anthropologists estimate that vegan diets may actually come closer to matching the macro- and micronutrient intakes of Palaeolithic diets than do new Paleo diets. 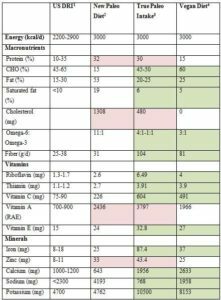 The following table summarises the results of a comparison among recommended paleo menus, recommended plant-based menus, and a true Palaeolithic diet eaten by early humans. The data compare three days of recommended Paleo menus from a popular Paleo website, three days of recommended plant-based (vegan) menus from Becoming Vegan: Comprehensive Edition, and the estimated average daily intakes of Palaeolithic people. The table also provides dietary reference intakes (DRI’s) for adult males (M) and adult females (F) who aren’t pregnant or lactating. Nutrients and other dietary factors in the new Paleo or vegan diet that are more similar to the true Palaeolithic diet are highlighted (pink for the new paleo diet and green for the vegan diet). Sources: New paleo data: average of 3 days (Wednesday, Thursday, and Friday) of recommended Paleo menus, adjusted to 3000 kcal20 . Vegan data: average of three days from the Becoming Vegan: Comprehensive Edition menus21 , adjusted to 3,000 calories. True Paleolithic data22 (( Konner M, Eaton SB. Paleolithic Nutrition: Twenty-Five Years Later. Nutr Clin Prac. 2010; 25:594–602. )) . *RDA for iron is 18 mg for women of childbearing age and 8 mg after age 50. The new Paleo menus supply protein, vitamin A, and zinc in amounts closer to a true Palaeolithic diet than do the vegan menus. However, new Paleo’s fat and saturated fat levels are about double that of the vegan menus. Cholesterol levels are almost triple. Sodium levels are five times as much as that of a true Palaeolithic diet. The new Paleo menus contain about a third of the carbohydrates, and half the vitamin C, calcium, and fibre of true Palaeolithic diet. Even 100 percent plant-based menus deliver fibre in amounts at the lowest end of the estimated Palaeolithic intake range. Since plants are the only source of fibre, it’s clear that our pre-agricultural ancestors ate plenty of plants. The vegan menus do provide intakes of carbohydrate, fat, saturated fat, fibre, riboflavin, thiamine, vitamin C, vitamin E, iron, calcium, sodium, and potassium that are closer to the levels supplied by a true Palaeolithic diet than do the new Paleo menus. New Paleo and the true Palaeolithic diets are so far apart nutritionally because of the differences between the meat and vegetables consumed today and those eaten in the Palaeolithic era. Wild animals eaten then provided an estimated 6-16% of calories from fat compared to about 40-60% in today’s domestic animals—even those that are grass-fed. They were also free of added hormones, antibiotics, and environmental contaminants. All animal organs were consumed. Insects provided significant amounts of protein. Almost all fruits and vegetables available in supermarkets are more palatable, more digestible, and easier to store and transport than their wild cousins, at the expense of valuable protective dietary components. Highly processed foods, refined carbohydrates, fried foods, and fast foods are eliminated. Fresh fruits, vegetables, nuts, and seeds are encouraged. Today’s Paleo eaters tend to include more meat than did early humans, ignoring the impressive evidence linking meat consumption to risk of chronic disease. Grains and legumes are dispensed with, even though these foods have a long and impressive track record as valuable sources of calories and protein for the world’s population. The value of legumes and grains in the human diet is validated by people of the Blue Zones 24 – the longest lived, healthiest populations in the world – all of whom consume legumes and grains as part of their traditional fare. They also argue that lectins naturally present in these starchy foods are harmful to human health. Consuming too many lectins can cause significant gastrointestinal distress. Sprouting also reduces lectin levels in plants, although not as effectively as cooking. Generally, pea sprouts, lentil sprouts, and mung bean sprouts are safe to consume, as are sprouted grains, which are naturally low in lectins. Most larger legumes contain higher amounts and should be cooked. With its focus on consuming large quantities of meat, the new paleo diet is a pale imitation of the diet of early humans. It also ignores the numerous health risks associated with eating meat, the ethical issues associated with an increased demand for food animals, and the looming environmental crisis that makes eating lower on the food chain an ecological imperative. Brenda Davis concludes that those who want to eat a true Palaeolithic diet should look at plant-based diets, since these come as close to the true pre-agricultural diet as one can hope to get. Dairy, poultry, fish, vegetable oils, (animal-based) saturated fat, trans fat, sodium, red meat, sweets and sugar-sweetened beverages do not make for an optimally healthy diet with which to compare any other diet, including the Paleo diet. Additionally, there is no indication about the actual consumption quantities of the above harmful foods. Advising people to “limit” these foods does not have a very successful track-record in ensuring that they either know what limits to adhere to or to accurately monitor and report the amounts they actually consumed. It would have been more interesting to compare the Paleo diet with a truly healthy plant-based diet, since almost any dietary change would improve on the woeful diet recommended by the AHA. A 2014 2-year long study29 compared an ad libitum Paleo diet (PD) with an ad libitum diet based on Nordic Nutrition Recommendations (NNR) 30 . See chart below to get an idea of the Nordic Nutrition Recommendations. 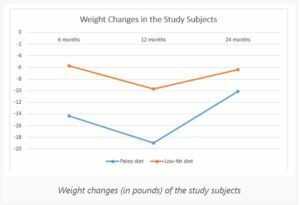 As the chart shows, the Paleo diet actually resulted in significant weight gain over the 24 month period as a whole. *An isoenergetic diet will have the same calories as the diet with which it is being compared. There are obvious benefits to the Paleo diet when compared with the SAD and some other supposedly healthy diets – this is largely because of the omission of certain unhealthy foods (dairy, fast food etc) and the inclusion of other healthy foods (vegetables and nuts etc) in the Paleo diet. On the other hand, problems exist both with its authenticity as a reflection of the actual diet eaten by pre-agricultural humans, and also with its medium to long-term effects on health. Specifically in relation to sports performance, there not only appears to be no clear evidence that Paleo diets aid sports performance, but research seems to suggest the opposite. More studies comparing a Paleo diet and a WFPB diet would be useful to settle the issue once and for all. However, until these studies appear, the body of research data already seems to lead one towards favouring the plant-based route, not just because of the foregoing in this article, but also because of the wealth of plant-based research that suggests the optimal diet for humans consists of the maximum amount of whole food plants and the minimum amount of animal protein35 and fat36 – the two latter of which are at dangerously high levels in all modern versions of the Paleo diet. In any case, whatever the new Paleo diet is today, it’s certainly not the relatively healthy real version that real Palaeolithic humans would have eaten during their average 35-year life span37 . In the next article (Original Palaeolithic Diets – Meat or Plants? ), we will look at what research has shown to be the likely diet of Palaeolithic humans – was it really so full of meat as some would have us believe? 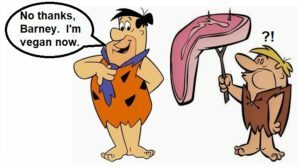 Next Next post: Original Palaeolithic Diets – Meat or Plants?